It costs less than a memory card but can this budget video editor offer a truly usable professional solution? A solution worth exploring, but there are easier and more effective alternatives available. Video editing packages can often be characterised by large numbers - large file sizes, extensive and complex feature specifications and, arguably most important, hefty price tags. 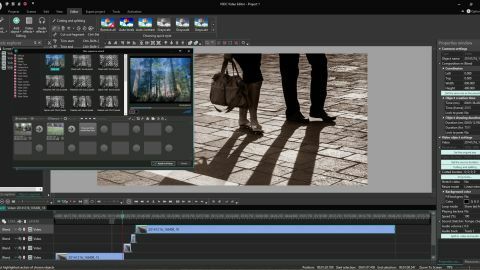 Applications such as Adobe Premiere Pro have become the industry standard for professional-level motion media production and command significant investment. There are a multitude of options for budget-conscious users, such as Cyberlink Power Director and Adobe Premiere Elements, which provide workable functionality but at a more accessible cost. The market for consumer-level video editing packages has expanded extensively in recent years, with more competing players. VSDC Pro from Vector Ltd is one of the most recent. VSDC is available as a free application and as a Pro version, costing $19.99, which is significantly less expensive than other similar software suites. The program offers the usual range of expected features, including clip trimming and cutting, application of transition effects and addition of audio. Usefully videos are loaded into separate tracks, which essentially function like Layers in Photoshop, allowing the user to arrange clips interactively along the timeline. An impressive aspect to this feature is that, beyond merely stacking video fragments, these layers can have Blend Modes applied to them, so that the pixels from one track interact with those on the tracks below (or above - more on that later). This opens up many creative possibilities, such as faux double-exposure effects and advanced colour blending, for cinematic storytelling purposes (think dream sequences or dramatic flashbacks). When multiple clips or media are imported simultaneously, these are placed together into Sprites, which group related objects. This makes it easier to keep track of objects once the timeline starts to become populated with items. For such an inexpensive application it is pleasing to see chroma keying included on the spec sheet, a function which is often left to the more advanced software options. This enables the user to remove backgrounds or selected areas of a frame, for a seamless blend with another video clip. For enthusiast users this will be very welcome, as with skill a believable green screen effect can be applied, placing foreground elements in a different setting, with minimal resources. The tool works well and allows multiple colour keying, so different backgrounds can be used for different lighting conditions. There are also a range of default special effects built into VSDC, with popular types such as Aging TV, which applies a fairly credible banding and noise pattern characteristic of older CRT televisions. The other options - Fire, Smoke and Water as examples - are not especially lifelike and are probably best avoided for most serious projects. The VSDC interface is attractive to look at, using a non-intrusive ‘lights-out’ dark grey colour scheme. All text and icons are easily visible and not offensive when working for extended periods. The layout is a little confusing however and is arguably overpopulated with tools. There is a docking mechanism, so frequently used panels can be pinned to the side bar for easier access, but the amount of information spread across the workspace may be overwhelming for inexperienced video editors. Unfortunately VSDC Pro is not the most intuitive suite to work with. When compared to other video editors, the process of orientation when starting out is quite a laborious one, with many tools proving difficult to find or revisit. Notable by its contradiction to almost every other software which requires media layout, the timeline is read from the bottom up, so clips or objects on the bottom track are actually at the top of the stack in the final video. While it is possible to get acquainted with this philosophy, it seems an unnecessary and quite illogical design decision. Furthermore, objects lack interactive control and cannot be dragged between tracks, meaning that to reorder them the up and down arrow buttons must be used. This all sums together to make the experience of familiarisation rather a traumatic adjustment, especially if the user is used to working with another application. We also found some of the basic functions frustrating to work with. Cutting and trimming, which should be a simple case of splitting tracks at the point of the play head, was unexpectedly challenging to understand. Cutting a clip removes all of the content past the cursor location from the project, essentially seeming to delete the video beyond that point. Splitting a clip using the Split Into Parts Tool is a more familiar operation, although this divides the video between two tracks, generating an increasingly complex timeline view. Another frustration is that clips don’t seem to be able to be extended by dragging the end handles. One the great features of Adobe Photoshop and other basic video editors is that, once cut, this trimming point can be overridden via extending the clip length, providing fine adjustment. In VSDC, should this be attempted, we found the remainder of the clip, past the point of splitting, is rendered an unplayable still image. While there may be a workaround we didn’t discover, this lack of interactivity highlights our overall impression of VSDC as an editor. While VSDC Pro is a worthwhile investment (at this price point you really don’t have much to lose) it feels like there is still some way to go to make it a genuine option for advanced videographers. There are some excellent features on offer, but for the audience for which the software was arguably developed – amateur and enthusiast creators – these seem over-complicated in practice. The tools work well, playback is smooth and there are an impressive range of output file formats. The inclusion of screen capture functionality is welcome and the direct Youtube and Social sharing buttons are convenient. Hopefully the developers will revisit these and make the interface more user-friendly in future versions.